Warren Area High School senior Ellie Lobdell smiles as she rounds third-base after hitting a 3-run home run in the bottom of the sixth inning against Slippery Rock. Those were the only runs of the game, as Lobdell also tossed a complete game shutout on the mound. 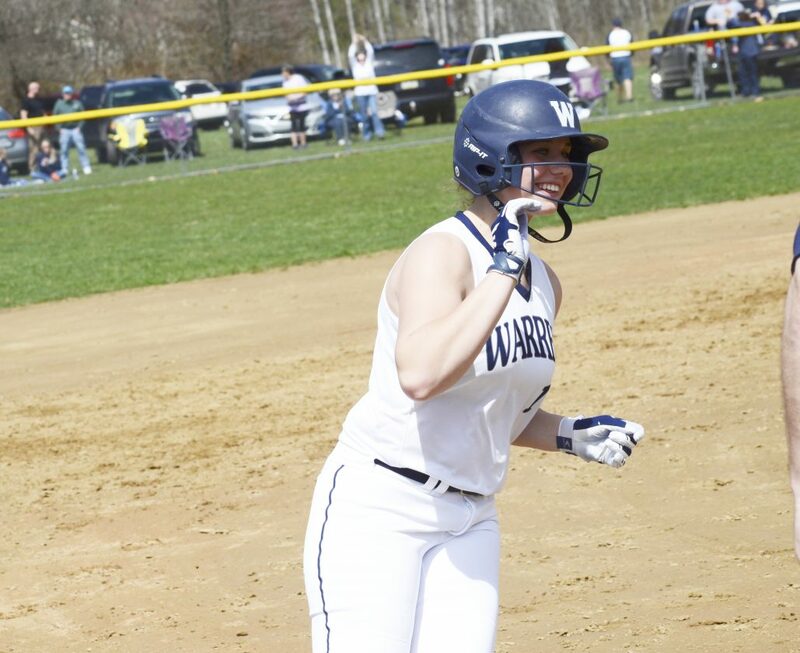 All was quiet for five innings in Warren softball’s second game with Slippery Rock this week. After beating the Rockets, 11-1, on Wednesday, the Dragons found themselves in a scoreless tie in the bottom of the sixth in the Saturday afternoon home game. Ellie Lobdell changed that with one swing of the bat, launching a 3-run home run that lifted Warren (5-1) to a 3-0 victory. Lobdell’s dinger was one of just two hits on the afternoon for the Dragons, but because she turned in another brilliant pitching performance, it was the difference. She gave up two of her three hits in the second inning, but was able to wiggle her way out of trouble with a groundout to second baseman Julia Lobdell to end the Rock threat. 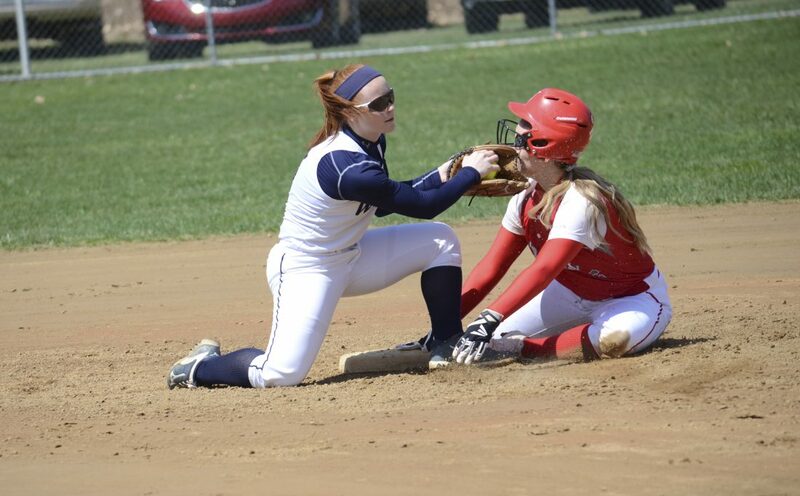 Warren shorstop Lex Nyquist tags out Slippery Rock’s Julianna Hutchinson attempting to steal second, on a strong throw from catcher Grace Wortman. Slippery Rock freshman Paige Gresgott came on in relief in Wednesday’s away game, but got the start on the mound Saturday in Warren. She was able to keep Warren’s hitters in check, not yielding a hit until Kiersten Hoffman’s two-out single in the fourth. Gracie Wood reached via error to start the fifth and was sacrificed to second by Kelsey Stuart, but Gresgott was able to escape the threat by inducing back-to-back pop outs. The defending Class 4A District 10-champion Rockets (3-4) couldn’t get anything going against Lobdell, as the senior hurler struck out the side in the fifth and allowed just one baserunner (via error) in the final three innings. Lex Nyquist reached via error to start the bottom of the fifth, and after Gresgott retired the next two batters, Hoffman worked a walk after being down in the count 0-2 to set up Lobdell’s home run. “We didn’t put up much of a fight for a few innings, but Ellie certainly carried us, which she can do,” said Warren coach Jon Sitler. “I’d prefer to have a little easier time of it, of course, and a little more energy and swagger, but I give the girls credit for battling to the end. These girls know what needs done, and I have a lot of faith in them; that starts with Ellie, Grace, Kiersten, Lex… and on down the line. It was a busy week, with two away games, and we came out of it unscathed. “On Saturday, Ellie showed what she’s capable of, and when we get everyone clicking at the same time, we will be fun to watch,” said Sitler. Winners of five-straight, the Dragons look to continue their winning ways Monday at St. Marys, weather permitting. Warren also won the junior varsity game, 13-3, in five innings. Kelsey Stuart got the win in the circle, allowing four hits and striking out nine. She also had a three-run triple and four RBI total in the win, and Katie Madigan three hits and three runs scored. Alix Lytle and Rylie Yeager each had two hits, including doubles. Sac – Stuart (W). HR – E. Lobdell (W).